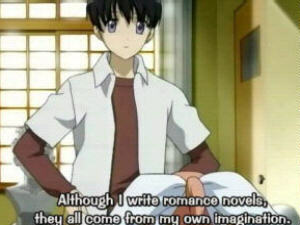 Pic of the day: "Although I write romance novels, they all come from my own imagination." Yes, it is true! Because I am Stupid Inside, I have decided to once again attempt to write a somewhat supernatural romance novel, the same thing that I have failed miserably at for the last two years. NaNoWriMo! It is the first of November, the (inter) National Novel Writing Month. I have taken a vacation day. Actually, I'm taking one vacation day every other day throughout the month. Every Tuesday and Thursday. I have been exercising since spring, and my wrist is much better than earlier years when I have done tried to do NaNoWriMo. Besides, I have the speech recognition software (Dragon NaturallySpeaking from ScanSoft) and a high-quality headset from Plantronics. What could go wrong? Actually a lot things could go wrong, but they didn't today. My wrist did hurt at the end of the day, but not horribly so. It should recover a great deal during the coming night. Tomorrow is workday, so there will be less typing on the novel. And the project at work which ruined my hand again is finished, at least for now. In the first chapter, I'm just introducing the protagonist and her love interest. Actually it is not love interest at first, of course. Love at first sight is not modern at all. Instead I'm setting them up as rivals in school (they're both going to college, although they're not living there). There will be an opportunity tomorrow for that relationship to change. One year ago: Sick. Writing. Three years ago: Finally: ADSL! Four years ago: Trick or treat?